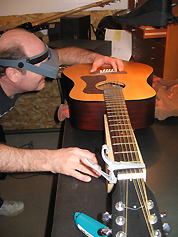 Here are some simple maintenance procedures that will keep your instrument in optimum condition and keep service work, when needed, less costly. As your instrument is likely made from wood, most of these tips are based on ordinary principles of nature. Don't hang your instrument. As in other practices, it stretches the neck. It is done in music stores, mostly short-term, to maximize floor space and to safely display them. Store them in the case as they are played, with the neck parallel to the ground. I set them up the way you play them. In general, keep your instrument in relative equilibrium with the environment. Even moderate temperature changes (humidity) change the dimensional characteristics of wood quickly. Your house likely has a dramatic difference in these factors between the basement and first floor. Transporting an instrument from a cold to a warm (an vice-versa) environment should be done with care. Most homes are too dry from forced-air heating. The affect of this is normally seen in the finish cracking. Other affects, often not seen, are even more degrading. Additional humidity is frequently needed in cool, dry environments. Unless you have a special insurance rider your equipment is not likely protected from damage or loss anywhere. Home, in the shop, on the road, or at a gig you are solely responsible for its insurance. I know from my experiences and those of others. Get a rider.